For today, I am sharing a sweet card I made for a pen pal who sent me some of her illustrations in a letter. I am not someone who draws or sketches, so I thought it would be fun to make her a card with my letter to her enclosed. 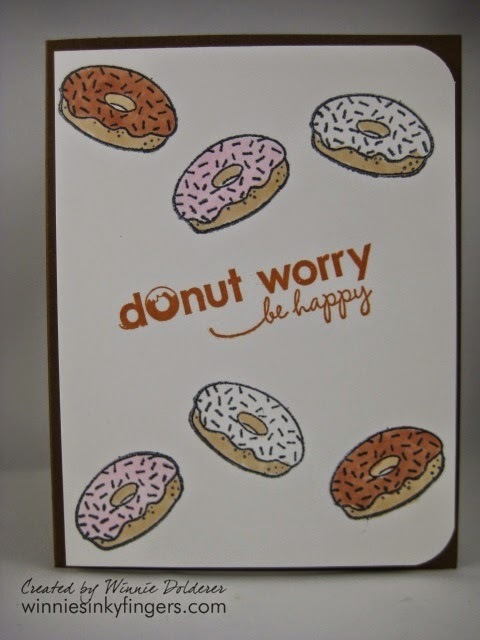 I found this funny sentiment stamp and knew I had a donut stamp in my stash that would go with it. After making this card, I really had a hankering for a donut (I have a major love for crullers.) Thankfully for my waist there weren't any in the house! Hope you have a fun and sweet-filled day! What a humorous way to say be happy! It's chocolate eclairs that get me in trouble - or a fresh croissant with butter and raspberry jam! Hope you're well! Sweet! That sounds like a good pun compliment to go with your cute pun sentiment. I'm sure your friend is going to love the card as much as your letter. Blessings, my friend! Now this is so punny! LOL! What a cutie this is, Winnie - a cheerful card to anyone who receives it, that's for sure!